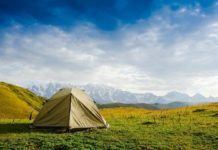 Camping with your beloved friends and family around breathtaking landscapes seems to be an once in a lifetime experience that everyone should have once. If you’ve never ever got tired of going camping like me and are looking for a beautiful destination for the next camping, please take a glance at our article to know top 6 well-known campgrounds in Arizona where are prime destinations for all travelers. Arizona is highly suitable for outdoors lovers. 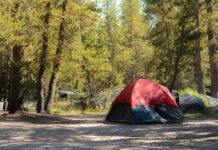 Let’s check out 6 famous campsites in Arizona below and pick up a suitable spot for your upcoming trip. If you are longing for camping in RV campgrounds, North Phoenix Campground is a perfect destination that you should check out. It is one of the best RV campgrounds in Arizona. Phoenix is the fifth most populated cosmopolitan desert city which is filled with charming vistas and hospitable inhabitants. In addition, due to being received more sun than other cities in the US, the North Phoenix Campground is an excellent destination for RV campers. Located less than 16 miles from downtown Arizona and surrounded by impressive beauty, it attracts million travelers each year. This park offers all types of activities like camping, hiking, relaxing, shopping and swimming. What is more, it is a pet-friendly campsite, hence, you don’t have to leave your four-legged members alone. In addition, the staff here is pretty nice and supportive. 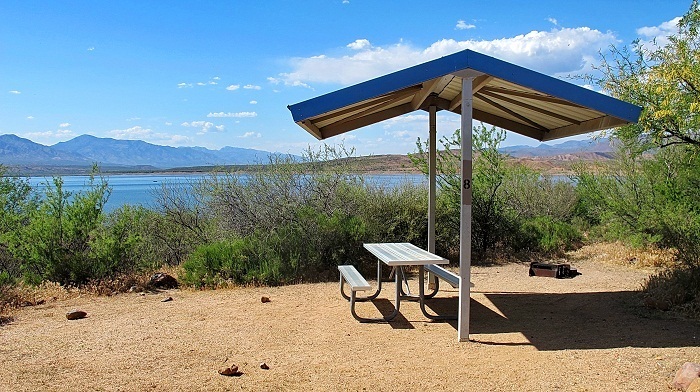 Located in the north of Globe, Cholla Campground is one of the best campgrounds in Arizona. It possesses a treasure that all travelers are looking for – hot showers. Additionally, it opens during the winter months. While other places like Arizona, Flagstaff and Prescott’s mountains having freezing temperatures as well as snow, Cholla Campground is basking in the bright and warm sunlight and pleasant weather. Possessing more than 200 campgrounds, however, it never feels so crowded. Plus, there are loads of water sports available. Hey RVers, if you are in a huge need of finding a beautiful spot for camping, Rancho Sedona RV Park will never let you down. This awesome oasis is hidden by the shade of sycamore and cottonwood trees in Oak Creek Village. Oak Creek impresses visitors with its breathtaking and wild highways surrounded by the big red rock buttes. 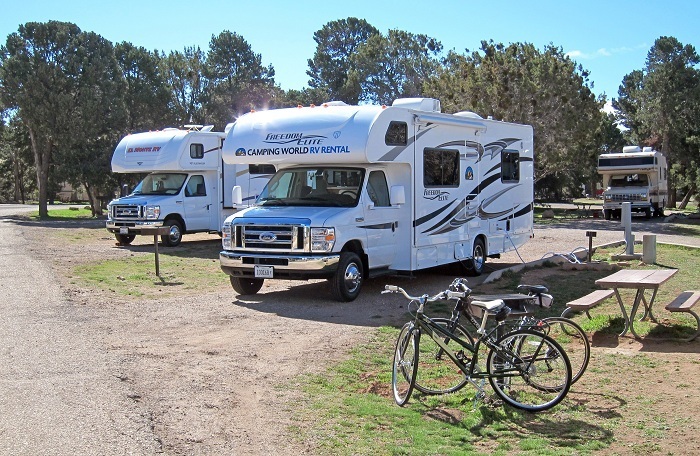 Sedona RV Park offers various activities for visitors such as camping, mountain biking, fishing, and hiking so you will never ever run out of things to do. For adventure enthusiasts, Sedona also provides helicopter and hot air balloon rides which definitely satisfy their hobbies. For those who like enjoying and relaxing, this RV park has loads of shops and spa. In addition, you could always keep in touch with your friends, go online to share your memories on social media channels and stay updated with the latest news as Sedona’s facilities include free Wi-fi, digital cable, and full hookups. With a 5640 ft elevation compared to sea level, Christopher Creek Campground’s truly fresh air and vibrant landscape are an enjoyment to behold. Furthermore, Christopher Creek also has a load of brown trout, brook, and rainbow for visiting fishermen. Christopher Creek is a perfect combination of forested surroundings and cool waters from the creek. The campsite also has three enormous swimming holes, extremely suitable for splashing around when the sun starts shining. The site is placed along the Mogollon Rim – an out-of-the-world cliff with striking and picturesque canyons and buttes. For those who are too fed up with cooking campfire breakfast on a multi-day camping journey. Here is good news. There area number of fine restaurants situated nearby where you could grab a bite. Moreover, the family campground has 43 sites surrounding the creek’s both sides. When you set foot on Christopher Creek, don’t forget to check out the most well-known recreational lakes in Arizona, so-called Woods Canyon Lake where offers various options for nature trail as well as boating. The weekend is coming, and you still don’t have any ideas for weekend getaways. Camping in Arizona near water is a great option for those who fancy outdoor activities. Give Fool Hollow Lake a try, and you’ll never regret. The Fool Hollow Lake is situated in the Apache – Sitgreaves National Forest where is highly suitable for camping, trekking, and bird – watching, you could see a bunch of animals such as bald eagles, blue herons or ospreys. If you have a reference for hands-on activities, going boating seems to be suitable for you. Plus, the campground provides a wide range of fun games for children with a horseshoe pit and two playgrounds. 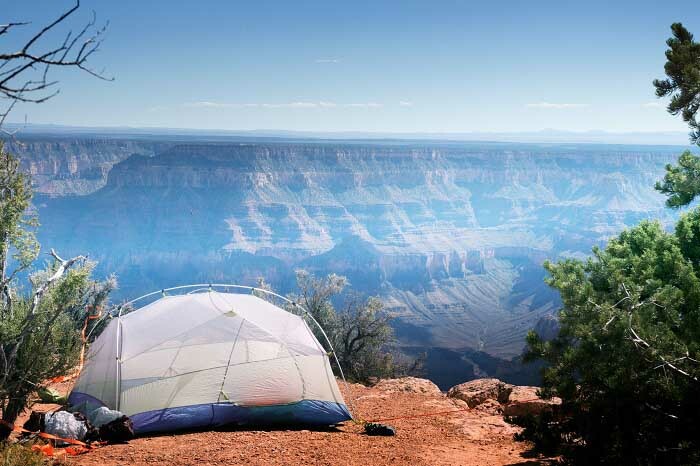 Grand Canyon Village is one of the top visited private campgrounds in Arizona. Privately owned by Grand Canyon, it is a convenient campsite for tents, trailers, and motorhomes. Especially, it opens all year and provides full service. Personally, I think the Grand Canyon Campground staff is quite enthusiastic and happy to assist customers. The campsite also provides RV ground with full hookups, small but well-designed souvenirs, coin-operated laundry, restroom and shower facilities. It’s never too late to set up a camping day, spend your precious time with those who are important to you and really get away from the heavy workload, the hustle and bustle of the city life, refresh your mind and get ready to a new week. Hopefully, after reading my article, you could pick out some campgrounds which meet your requirements and liking. Please press the like button if you found this article constructive and don’t hesitate to comment down below your questions, I’ll reply as soon as possible. And stay stunned as I will come back with loads of interesting and helpful articles relating to camping for beginners guideline and tips. Next articleBest Camping Chair For Bad Back 2018 Reviews – Let’s Find Out! The 5 Best Campground In Yosemite – Find Out Now!